Power Plant Instrumentation and Control Handbook, Second Edition, provides a contemporary resource on the practical monitoring of power plant operation, with a focus on efficiency, reliability, accuracy, cost and safety. It includes comprehensive listings of operating values and ranges of parameters for temperature, pressure, flow and levels of both conventional thermal power plant and combined/cogen plants, supercritical plants and once-through boilers. It is updated to include tables, charts and figures from advanced plants in operation or pilot stage. Practicing engineers, freshers, advanced students and researchers will benefit from discussions on advanced instrumentation with specific reference to thermal power generation and operations. New topics in this updated edition include plant safety lifecycles and safety integrity levels, advanced ultra-supercritical plants with advanced firing systems and associated auxiliaries, integrated gasification combined cycle (IGCC) and integrated gasification fuel cells (IGFC), advanced control systems, and safety lifecycle and safety integrated systems. Swapan Basu is a member of IEEE and IEEE Instrumentation & Measurement. He has several decades of experience in practicing instrumentation & control systems for subcritical, super critical thermal power plants including combined cycle projects. Since 1979, he has been leading teams of engineers in India, Jordan, Singapore, South Korea, Syria, and USA. He has a number of national and international technical papers to his credit. 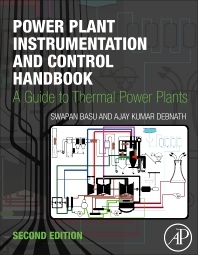 With Elsevier BV had already authored books entitled “Power Plant instrumentation and control Handbook”, “Plant Hazard Analysis and Safety Instrumentation Systems” and “Plant Flow Metering and control handbook”. Author also maintains technical Blog: http://swapanbasu.com. Author’s update is available at: https://www.amazon.com/author/swapanbasu . He is founder member of Systems & Controls – C&I consultants in Kolkata India. Ajay Kumar Debnath is Chief Executive, Systems and Controls, Control and Instrumentation Engineering and Consulting Kolkata, India. He has practiced both electrical and C&I system in power plants and textile and fertilizer plants. He has over 43 years of experience and has worked in India, France, and the United States in fossil fuel power plants from 30 MW up to 660 MW Supercritical Power Plants and co-generation as well as in combined cycle plants with gas, bagasse, and tar as fuel.